Joseph Mallord William Turner (April 23, 1775 – December 19, 1851) was an English Romantic landscape painter, watercolorist, and printmaker. His paintings are noted for their impressive use of light. Turner was one of the Romantics who rejected the rationalism of the Enlightenment, and sought to express the internal longings of his soul in his painting. Turner was born in Covent Garden, London, England. His father, William Gay Turner (January 27, 1738 – August 7, 1829), was a barber and wig maker. His mother, Mary Marshall, became increasingly mentally unstable, perhaps, in part, due to the early death of Turner's younger sister in 1786. She died in 1804, after having been committed in 1799 to a mental asylum. 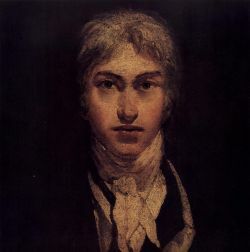 Possibly due to the load placed on the family by these problems, the young Turner was sent, in 1785, to stay with his uncle on his mother's side in Brentford, which was then a small town west of London on the banks of the River Thames. It was here that he first expressed an interest in painting. A year later he went to school in Margate in Kent to the east of London in the area of the Thames estuary. By this time he had created many drawings, which his father exhibited in his shop window. The fighting Temeraire tugged to her last berth to be broken up, painted 1839. He entered the Royal Academy of Art schools in 1789, when he was only 14 years old, and was accepted into the academy a year later. Sir Joshua Reynolds, president of the Royal Academy at the time, chaired the panel that admitted him. At first Turner showed a keen interest in architecture but was advised to keep to painting by the architect Thomas Hardwick (junior). A watercolor of Turner's was accepted for the Royal Academy Summer Exhibition of 1790, after only one year's study. He exhibited his first oil painting in 1796, Fishermen at Sea and thereafter exhibited at the academy nearly every year for the rest of his life. Although renowned for his oils, Turner is also one of the greatest masters of British watercolor landscape painting. He is commonly known as "the painter of light." One of his most famous oil paintings is The fighting Temeraire tugged to her last berth to be broken up, painted in 1838, which hangs in the National Gallery, London. Turner traveled widely in Europe, starting with France and Switzerland in 1802, studying in the Louvre Museum in Paris in the same year. He also made many visits to Venice during his lifetime. On a visit to Lyme Regis, in Dorset, England, he painted a stormy scene (now in the Cincinnati Art Museum). Turner was also a frequent guest of Lord Egremont at Petworth House in West Sussex and painted scenes from the grounds of the house and of the Sussex countryside, including a view of the Chichester Canal that Egremont funded. Petworth House still displays a number of paintings. The shipwreck of the Minotaur, oil on canvas. As he grew older, Turner became more eccentric. He had few close friends except for his father, who lived with him for 30 years, eventually working as his studio assistant. His father's death, in 1829, had a profound effect on him, and thereafter he was subject to bouts of depression. He never married, although he had two daughters by Sarah Danby, one born in 1801, the other in 1811. He died in the house of his mistress Mrs. Sophia Caroline Booth in Cheyne Walk, Chelsea on December 19, 1851. At his request he was buried in Saint Paul's Cathedral, where he lies next to Sir Joshua Reynolds. His last exhibition at the Royal Academy was in 1850. Turner's talent was recognized early in his life. He became a full art academician at the age of 29. Financial independence allowed Turner to innovate freely; his mature work is characterized by a chromatic palette and broadly applied atmospheric washes of paint. According to David Piper's The Illustrated History of Art, his later pictures were called "fantastic puzzles." However, Turner was still recognized as an artistic genius: the influential English art critic John Ruskin described Turner as the artist who could most "stirringly and truthfully measure the moods of Nature." 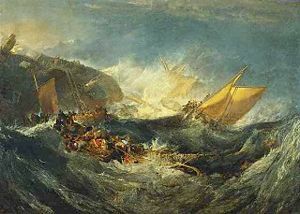 Suitable vehicles for Turner's imagination were to be found in the subjects of shipwrecks, fires (such as the burning of Parliament in 1834, an event which Turner rushed to witness first-hand, and which he transcribed in a series of watercolor sketches), natural catastrophes, and natural phenomena such as sunlight, storm, rain, and fog. He was fascinated by the violent power of the sea, as seen in Dawn after the Wreck (1840) and The Slave Ship (1840). Rain, Steam and Speed—The Great Western Railway painted (1844). His first works, such as Tintern Abbey (1795) and Venice: S. Giorgio Maggiore (1819), stayed true to the traditions of English landscape. However, in Hannibal Crossing the Alps (1812), an emphasis on the destructive power of nature had already come into play. His distinctive style of painting, in which he used watercolor technique with oil paints, created lightness, fluency, and ephemeral atmospheric effects. One apocryphal story about Turner claims that he even had himself "tied to the mast of a ship in order to experience the drama" of the elements during a storm at sea. In his later years, he used oils ever more transparently, and turned to an evocation of almost pure light by use of shimmering color. A prime example of his mature style can be seen in Rain, Steam and Speed—The Great Western Railway, where the objects are barely recognizable. The intensity of hue and interest in evanescent light not only placed Turner's work in the vanguard of English painting, but later exerted an influence upon art in France, as well; the Impressionists, particularly Claude Monet, carefully studied his techniques. 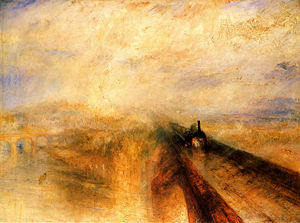 In the modern art era, advocates of abstract art were also inspired by Turner. It has been suggested that the high levels of ash in the atmosphere during the 1816 "Year Without a Summer," which led to unusually spectacular sunsets during this period, were an inspiration for some of Turner's work. His true master was Dr Monro; to the practical teaching of that first patron and the wise simplicity of method of watercolour study, in which he was disciplined by him and companioned by Giston, the healthy and constant development of the greater power is primarily to be attributed; the greatness of the power itself, it is impossible to over-estimate. Turner left a small fortune which he hoped would be used to support what he called "decayed artists." Part of the money went to the Royal Academy of Arts, which now does not use it for this purpose though occasionally it awards students the Turner Medal. His collection of finished paintings was bequeathed to the British nation, and he intended that a special gallery would be built to house them. This did not come to pass owing to a failure to agree on a site, and then to the parsimony of British governments. Twenty-two years after his death, the British Parliament passed an Act allowing his paintings to be lent to museums outside London, and so began the process of scattering the pictures which Turner had wanted to be kept together. In 1910, the main part of the Turner Bequest, which includes unfinished paintings and drawings, was rehoused in the Duveen Turner Wing at the Tate Gallery. In 1987 a new wing of the Tate, the Clore Gallery, was opened specifically to house the Turner bequest, though some of the most important paintings in it remain in the National Gallery in contravention of Turner's condition that the finished pictures be kept and shown together. In 1974, the Turner Museum was founded in Sarasota, Florida by Douglass Montrose-Graem to house his collection of Turner prints, with an online gallery and catalog of complete listing of Turner works. A prestigious annual art award, the Turner Prize, created in 1984, was named in Turner's honor, but has become increasingly controversial, having promoted art which has no apparent connection with Turner's. Twenty years later the more modest Winsor & Newton Turner Watercolour Award was founded. A major exhibition, "Turner's Britain," with material, (including The Fighting Temeraire) on loan from around the globe, was held at Birmingham Museum & Art Gallery from November 7, 2003 to February 8, 2004. 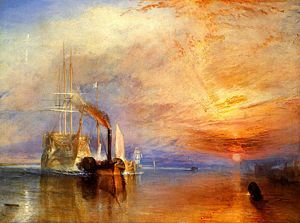 In 2005, Turner's The Fighting Temeraire was voted Britain's "greatest painting" in a public poll organized by the BBC. In October 2005, Professor Harold Livermore, its owner for 60 years, gave Sandycombe Lodge, the villa at Twickenham which Turner designed and built for himself, to the Sandycombe Lodge Trust to be preserved as a monument to the artist. In 2006, he additionally gave some land to the Trust which had been part of Turner's domaine. The Friends of Turner's House were formed in 2004, to support it. In April 2006, Christie's New York auctioned Giudecca, La Donna Della Salute and San Giorgio, a view of Venice exhibited at the Royal Academy in 1841, for US$35.8 million, setting a new record for a Turner. The New York Times stated that according to two sources who had requested anonymity the buyer was casino magnate Stephen Wynn. In 2006, Turner's Glaucus and Scylla (1840) was returned by Kimbell Art Museum to the heirs of John and Anna Jaffe after a Holocaust Claim was made, and documentation supported the claim that the Jaffé collection may have been unlawfully seized by the pro-Nazi Vichy regime in France in 1943. The painting is scheduled to be sold by Christie's in April of 2007. ↑ Oxford Dictionary of National Biography, J.M.W. Turner. Retrieved September 8, 2008. ↑ A.J. Finberg, The Life of J.M.A. Turner, R.A. (Oxford: Clarendon Press, 1961), 17. ↑ National Gallery, London, Turner, Joseph Mallord William. Retrieved February 13, 2008. ↑ David Piper and Philip Rawson, The Illustrated History of Art (London: Chancellor Press, 2000), 321. ↑ Tate Gallery, 3D Gallery. Retrieved February 13, 2008. ↑ Turner Museum, Homepage. Retrieved February 13, 2008. ↑ BBC News, Greatest Painting Poll. Retrieved February 13, 2008. ↑ Art Daily, News story. Retrieved February 13, 2008. ↑ News-Antique, Story. Retrieved September 8, 2008. Bullen, J. B. The Sun is God: Painting, Literature, and Mythology in the Nineteenth Century. Oxford University Press, 1989. ISBN 0198128843. Piper, David and Philip Rawson. The Illustrated History of Art. London: Chancellor Press, 2000. ISBN 0753701790. All links retrieved March 11, 2018. History of "J. M. W. Turner"
This page was last modified on 12 March 2018, at 00:03.